Spooner is a balance board that helps develop core strength, stability, leg strength, balance, coordination, and gross-motor skills. It can be used indoors and outdoors on carpet, concrete, sand, gravel, and snow. The board can be used as a simulator for surf, skate, and snowboard training. 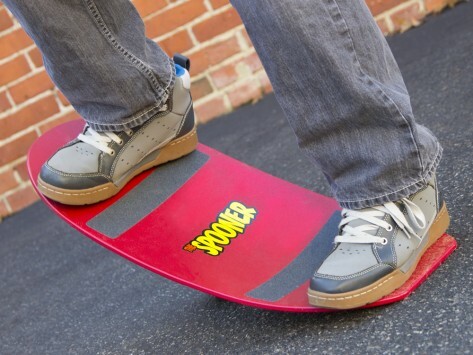 It's ideal for adults who want to master board sports or children over 4 feet tall. Dimensions: 27" x 11.5" x 2"
My 15 year old nephew totally enjoys playing with this. That's such a hard age to buy for and he really loves it. Inside or out, the kids enjoy this Spooner. Multiple purposes - it's fun, great to use for balancing, exercise, it reminds of a skateboard only differences is the curve and no wheels. It would be cool to try on multiple surfaces like snow, water, or sand. Our testers had a rocking good time trying it out. But don’t just take our word for it. Spooner has been recognized by leading toy organizations in the United States.